VisionPlates™ are our best plates for your most advanced applications. When visualising fluorescent signals from anything between a single molecule to a whole cell, VisionPlates™ will give accurate and consistent results. 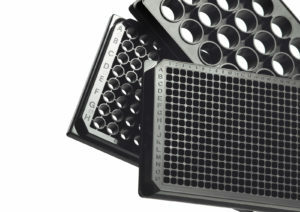 Suitable for cell-bases high content screening (HCS), conical microscopy, FRET and homogeneous assays, results show an optimum signal-to-noise ratio and a high consistency essential for automated high throughput. Using state of the art technology 4titude® have developed a product which offers key advantages to the end user.